WATERBURY, Conn. - May 18, 2016 - PRLog -- The Waterbury Regional Chamber will host their 11th Health Care Council (HCC) Annual Meeting and Awards Breakfast on Tuesday, June 14 beginning at 8:00 AM at the Crowne Plaza Hotel at 1284 Strongtown Road in Southbury. The breakfast event will present awards to four exceptional local health care professionals and organizations in the Greater Waterbury region. Recipients of the 2016 Waterbury Regional Chamber HCC awards are: Chad Wable, FACHE, St. Mary's Health System and Darlene Stromstad, FACHE, Waterbury Hospital will both receive individual HCC Leadership Award; U.S. 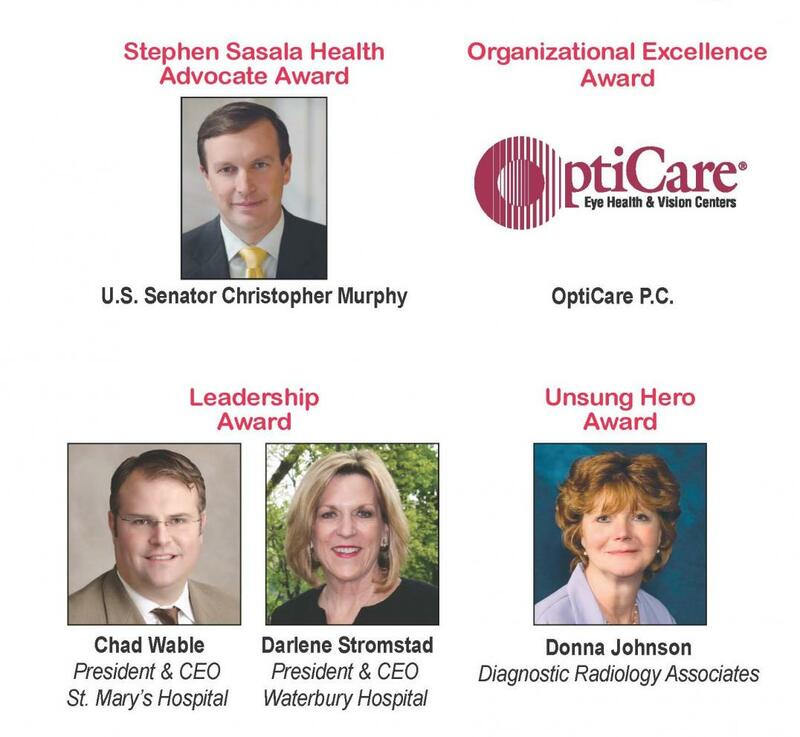 Senator Christopher Murphy will receive the Stephen Sasala Health Advocate Award; OptiCare PC will receive the HCC's Organizational Excellence Award; and Donna Johnson, community relations liaison with Diagnostic Radiology Associates (DRA) will receive the HCC's Unsung Hero Award. Brian Emerick, Access Rehab Centers, HCC Chairperson, commented, "The Waterbury region has many outstanding health care organizations. Each year we create the opportunity to honor and recognize the outstanding contributions of individuals and organizations and for their exceptional contributions to the Greater Waterbury region at large." HCC's 2016 Leadership Awards will be presented to Chad Wable, FACHE, St. Mary's Health System and Darlene Stromstad, FACHE, Waterbury Hospital. "Through their esteemed and highly-regarded significant leaderships of Waterbury's two hospitals," Lynn Ward, Waterbury Regional Chamber President and CEO, commented, "both Chad Wable and Darlene Stromstad have made substantial impacts on the Greater Waterbury region for improving and protecting the health of our entire community. These two revered professionals have more than succeeded in raising awareness of significant health care needs within the Waterbury community. They have both worked to initiate change, significantly enhanced the quality of care while creating new health care services, plus they have both consistently, and admirably, demonstrated the vision and foresight mandatory for creating a healthier future for everyone throughout our community." The Waterbury Regional Chamber's Health Care Council's 2016Stephen Sasala Health Advocate Award will be presented to U.S. Senator Christopher Murphy. "Senator Murphy is being honored," stated Ward, "for his dedicated work surrounding the opioid epidemic locally as well as nationally. He is being honored for his commitment of tremendous resources to this health crisis. His tireless ambitions are helping to keep this epidemic front and center for our community. By using his own distinguished capabilities and competencies, he has continually demonstrated an admirable ability to improve health care provisions, and influence health-related issues in a positive manner." The 2016 recipient of the Waterbury Regional Chamber's Health Care Council's Organizational Excellence Award is OptiCare PC for its ability to demonstrate the best qualities of a health provider. Through exceptional commitment to safety, quality, positive outcomes, and compassionate care, OptiCare exemplifies the ideals that embody excellence in everything it does. In practice for nearly four decades, OptiCare has been recognized as trailblazers and premier leaders in Connecticut's medical/surgical eye care arena. With offices in five locations in Connecticut, and doctors in nearly all sub-specialty areas of eye care, OptiCare is viewed as an innovative, multi-specialty practice. The medical group is also known as a pro-active, growing medical/surgical practice at the forefront of eye care health. An active supporter of the Waterbury community, OptiCare is a generous supporter of numerous civic, business and community and educational oriented activities. Donna Johnson, Diagnostic Radiology Associates Community Relations Liaison, is recipient of the 2016 Waterbury Regional Chamber's Health Care Council's Unsung Hero Award. Nancy Cappello, PhD, founder of Are You Dense, Inc., was just one of the many who nominated Ms. Johnson stating, "As the community relations liaison for Diagnostic Radiology Associates (DAR), Donna has been active for nearly 20 years promoting breast health and working with numerous related organizations in the Greater Waterbury region. She has spent countless hours personally volunteering outside her 'work hours' including being president of Are You Dense Inc. She has led numerous fundraisers and volunteered for TGIF for several years, as well as Easter Seals and the Waterbury Regional Chamber's Health Care Council's Out for Health events. Her time and volunteerism has raised countless funds for numerous nonprofit organizations throughout the area." Platinum sponsor of the June 14 HCC Awards Breakfast is Saint Mary's Health System. Gold sponsors are Barker Specialty Company, Harold Leever Regional Cancer Center, Naugatuck Valley Radiology, Waterbury Hospital, and OptiCare Eye Health and Vision Centers. Silver sponsors are Access Rehab Centers and CohnReznick LLP. The Waterbury Regional Chamber represents over 1,100 businesses in the Greater Waterbury region. One of Connecticut's largest chambers, the Chamber, and its Health Care Council, creates and distributes a semi-annual "Health Matters" magazine in the Waterbury "Republican-American" newspaper. Costs for the June 14th HCC Annual Meeting and Awards Breakfast are $35 for Waterbury Regional Chamber members, $50 for non-members, and $400 for a table of ten. To learn more, and to reserve a seat, visit the Waterbury Regional Chamber website at www.waterburychamber.com or call 203-757-0701.